Telegraphy (from the Greek words tele = far and graphein = write) is the long-distance transmission of written messages without physical transport of letters. Originally, it involved changes that could be observed from a distance, known as optical telegraphy. Radiotelegraphy, or wireless telegraphy, involves the transmission of messages using radio. Telegraphy includes recent forms of data transmission such as fax, email, and computer networks in general. A telegraph is a machine for transmitting and receiving messages over long distances, that is, for telegraphy. The word telegraph alone generally refers to an electrical telegraph. Wireless telegraphy is also known as CW, for continuous wave (a carrier modulated by on-off keying, as opposed to the earlier radio technique using a spark gap). Telegraphy forms the foundation for almost all of the communication devices we have today. It may also be considered the foundation of computer programming. If one examines the structures of some of the first computer languages, one can find connections between the basics of early telegraph codes (such as Morse) and computer programming. Telegraph messages sent by the telegraph operators using Morse code were known as telegrams or cablegrams, often shortened to a cable or a wire message. Later, telegrams sent by the Telex network, a switched network of teleprinters similar to the telephone network, were known as telex messages. Before long distance telephone services were readily available or affordable, telegram services were very popular. Telegrams were often used to confirm business dealings and, unlike e-mail, telegrams were commonly used to create binding legal documents for business dealings. Wire picture or wire photo was a newspaper picture that was sent from a remote location by a facsimile telegraph. The first telegraphs came in the form of optical telegraphs, including the use of smoke signals and beacons, which have existed since ancient times. 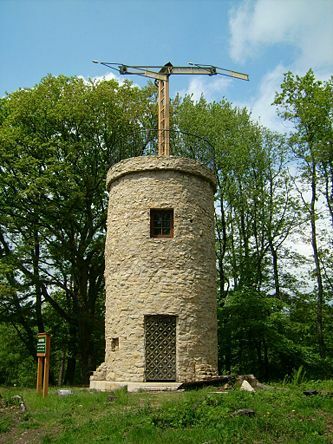 A semaphore network invented by Claude Chappe operated in France from 1792 through 1846. It helped Napoleon enough that it was widely imitated in Europe and the United States. The last (Swedish) commercial semaphore link left operation in 1880. Semaphores were able to convey information more precisely than smoke signals and beacons and consumed no fuel. Messages could be sent at much greater speed than post riders and could serve entire regions. However, like beacons and smoke signals, they were dependent on good weather to work. They required operators and towers every 30 km (20 mi), and could only accommodate about two words per minute. This was useful to governments, but too expensive for most commercial uses other than commodity price information. Electric telegraphs were to reduce the cost of sending a message thirtyfold compared to semaphore. In 1775, Francisco de Salva offered an electrostatical telegraph. Samuel T. Soemmering constructed his electrochemical telegraph in 1809. Also as one of the first, an electromagnetic telegraph was created by Baron Schilling in 1832. Carl Friedrich Gauß and Wilhelm Weber built and used for regular communication the first electromagnetic telegraph in 1833 in Göttingen.The first commercial electrical telegraph was constructed by Sir William Fothergill Cooke and entered use on the Great Western Railway. It ran for 13 miles from Paddington station]to West Drayton and came into operation on April 9, 1839. It was patented in the United Kingdom in 1837. In 1843, Scottish physician Alexander Bain invented a device that could be considered the first facsimile machine. He called his invention a "recording telegraph." Bain's telegraph was able to transmit images by electrical wires. In 1855, an abbot, Giovanni Caselli, in Italy also created an electric telegraph that could transmit images. Caselli called his invention "Pantelegraph." Pantelegraph was successfully tested and approved for a telegraph line between Paris and Lyon. The first modern telegram transmitted with repeaters: "What hath God wrought?" sent by Samuel Morse in 1844. An electrical telegraph was independently developed and patented in the United States in 1837 by Samuel Morse. His assistant, Alfred Vail, developed the Morse code signaling alphabet with Morse. America's first telegram was sent by Morse on January 6, 1838, across two miles of wiring. The message read "A patient waiter is no loser." On May 24, 1844, he sent the message, "What hath God wrought?," (quoting Numbers 23:23) from Washington to Baltimore, using repeater technology. The Morse/Vail telegraph was quickly deployed in the following two decades. The first transatlantic telegraph cable was successfully completed on July 27, 1866, allowing transatlantic telegraph communications for the first time. Earlier submarine cable transatlantic cables installed in 1857 and 1858 only operated for a few days or weeks before they failed. The study of underwater telegraph cables accelerated interest in mathematical analysis of these transmission lines. 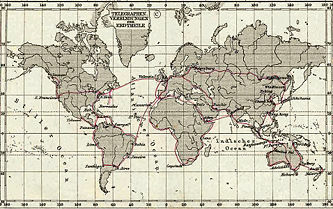 The telegraph lines from Britain to India were connected in 1870 (those several companies combined to form the Eastern Telegraph Company in 1872). The telegraph across the Pacific was completed in 1902, thus telegraph at last was the girdle around the world. Another advancement in telegraph technology occurred on August 9, 1892, when Thomas Edison received a patent for a two-way telegraph. He received U.S. Patent 0480,567 (PDF), "Duplex Telegraph." Nikola Tesla and other scientists and inventors showed the usefulness of wireless telegraphy, radiotelegraphy, or radio, beginning in the 1890s. Alexander Stepanovich Popov demonstrated to the public his receiver of wireless signals, also used as a lightning detector, on May 7, 1895. It is considered that Guglielmo Marconi sent and received his first radio signal in Italy up to six kilometres in 1896. Around the turn of the century, it is reported that he broadcast signals across the English Channel and, shortly thereafter, Marconi radiotelegraphed the letter "S" across the Atlantic Ocean from England to Newfoundland. In 1898, Popov accomplished successful experiments of wireless communication between a naval base and a battle ship. In 1900, the crew of the Russian battle ship General-Admiral Apraksin as well as stranded Finnish fishermen were saved in the Gulf of Finland because of exchange of distress telegrams between two radio stations, located at Gogland island and inside a Russian naval base in Kotka. Both stations of wireless telegraphy were built under Popov's instructions. Radiotelegraph proved effective in communication for rescue work when a sea disaster occurred. Effective communication was able to exist between ships and from ship to shore. With the invention of the teletypewriter, telegraphic encoding became fully automated. Early teletypewriters used Baudot code, a 5-bit code. This yielded only thirty two codes, so it was over-defined into two "shifts," "letters" and "figures." An explicit, unshared shift code prefaced each set of letters and figures. Even today, we use the term Baud rate to indicate the speed of a modem. The airline industry remains one of the last users of Teletype and in a few situations still sends messages over the SITA or AFTN networks. 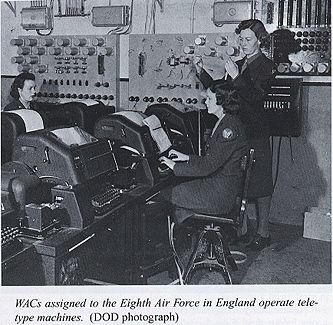 For example, The British Airways operations computer system (FICO) as of 2004 still used teletype to communicate with other airline computer systems. The same goes for PARS (Programmable Airline Reservation System) and IPARS that used a similar shifted 6-bit Teletype code, because it requires only 8 bits per character, saving bandwidth and money. A teletype message is often much smaller than the equivalent EDIFACT or XML message. In recent years, as airlines have had access to improved bandwidth in remote locations, IATA standard XML is replacing Teletype as well as (EDI). A standard timing system developed for telecommunications. The "mark" state was defined as the powered state of the wire. In this way, it was immediately apparent when the line itself failed. The characters were sent by first sending a "start bit" that pulled the line to the unpowered "space" state. The start bit triggered a wheeled commutator run by a motor with a precise speed (later, digital electronics). The commutator distributed the bits from the line to a series of relays that would "capture" the bits. A "stop bit" was then sent at the powered "mark state" to assure that the commutator would have time to stop, and be ready for the next character. The stop bit triggered the printing mechanism. Often, two stop bits were sent to give the mechanism time to finish and stop vibrating. 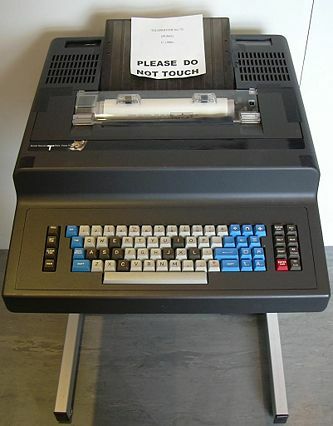 A Siemens T100 Telex machine. A late-model British Telecom Puma machine. By 1935, message routing was the last great barrier to full automation. Large telegraphy providers began to develop systems that used telephone-like rotary dialing to connect teletypes. These machines were called "telex." Telex machines first performed rotary-telephone-style pulse dialing, and then sent baudot code. This "type A" telex routing functionally automated message routing. 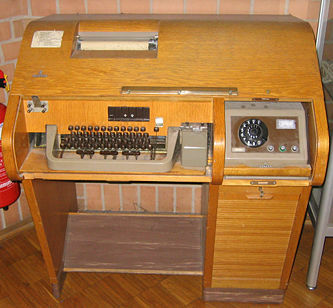 The first wide-coverage telex network was implemented in Germany during the 1930s. The network was used to communicate within the government. At the then-blinding rate of 45.5 bits per second, up to 25 telex channels could share a single long-distance telephone channel, making telex the least expensive method of reliable long-distance communication. In 1970, Cuba and Pakistan were still running 45.5 baud type A telex. Telex is still widely used in some developing countries' bureaucracies, probably because of its low costs and reliability. The UN asserts that more political entities are reliably available by telex than by any other single method. Around 1960, some nations began to use the "figures" baudot codes to perform "Type B" telex routing. Telex grew around the world very rapidly. Long before automatic telephony was available, most countries, even in central Africa and Asia, had at least a few high-frequency (shortwave) telex links. Often these radio links were the first established by government postal and telegraph services (PTTs). The most common radio standard, CCITT R.44 had error-corrected retransmitting time-division multiplexing of radio channels. Most impoverished PTTs operated their telex-on-radio (TOR) channels non-stop, to get the maximum value from them. The cost of telex on radio (TOR) equipment has continued to fall. Although initially specialized equipment was required, many amateur radio operators now operate TOR (also known as RTTY) with special software and inexpensive adapters from computer sound cards to shortwave radios. In Germany alone, more than 400,000 telex lines remain in daily operation. Over most of the world, more than three million telex lines remain in use. A major advantage of Telex was (is) that the receipt of the message by the recipient could be confirmed with a high degree of certainty by the "answerback." At the beginning of the message, the sender would transmit a WRU (who are you) code, and the recipient machine would automatically initiate a response which was usually encoded in a rotating drum with pegs, much like a music box. The position of the pegs sent an unambiguous identifying code to the sender, so the sender was sure that he was connected to the correct recipient. The WRU code would also be sent at the end of the message, so a correct response would confirm that the connection had remained unbroken during the message transmission. This gave Telex a major advantage over other unreliable forms of communications such as telephone and fax. The usual method of operation was that the message would be prepared off-line, using paper tape. All common Telex machines incorporated a 5-hole paper tape reader and paper tape punch. Once the paper tape had been prepared, the message could be transmitted in minimum time. Telex billing was always by connected duration, so minimizing the connect time saved money. However, it was also possible to connect in "real time," where the sender and the recipient could both type on the keyboard and these characters would be immediately printed on the distant machine. Almost in parallel with Germany's telex system, AT&T in the 1930s decided to go telex one better, and began developing a similar service (with pulse dialing among other features) called "Teletype Wide-area eXchange" (TWX). AT&T, also known as the Bell system, acquired the Teletype Corporation in 1930 and used its teleprinters for TWX. TWX originally ran 75 bits per second, sending Baudot code and dial selection. However, Bell later developed a second generation of "four row" modems called the "Bell 101 dataset," which is the direct ancestor of the Bell 103 modem that launched computer time-sharing. The 101 was revolutionary because it ran on ordinary subscriber lines that could (at the office) be routed to special exchanges called "wide-area data service." Because it was using the public switched telephone network, TWX had special area codes: 510, 610, 710, 810 and 910. With the demise of TWX service, these codes were re-provisioned as standard geographic NPAs in the 1990s. Bell's original consent agreement limited it to international dial telephony. Western Union] Telegraph Company had given up its international telegraphic operation in a 1939 bid to monopolize United States telegraphy by taking over ITT's PTT business. The result was deemphasis on telex in the U.S. and a cat's cradle of small U.S. international telex and telegraphy companies. These were known by regulatory agencies as "International Record Carriers." Western Union Telegraph Company developed a spinoff called "Cable System." Cable system later became Western Union International. ITT's "World Communications" was amalgamated from many smaller companies: "Federal Telegraph," "All American Cables and Radio," "Globe Wireless," and a common carrier division of Mackay Marine. RCA communications had specialised in crossing the Pacific. It later joined with Western Union International to become MCI. Before World War I, Tropical Radiotelegraph put radio telegraphs on ships for its owner, The United Fruit Company, in order to deliver bananas to the best-paying markets. Communications expanded to UFC's plantations, and were eventually provided to local governments. TRT Telecommunications (as it is now known) eventually became the national PTT of many small Central American nations. The French Telegraph Cable Company (owned by French investors) had always been in the U.S. It laid cable from the United States to France. It was formed by "Monsieur Puyer-Quartier." This is how it got its telegraphic routing ID "PQ." Firestone Rubber developed its own IRC, the "Trans-Liberia Radiotelegraph Company." It operated shortwave from Akron, Ohio to the rubber plantations in Liberia. TL is still based in Akron. As of 2006, most telegraphic messages are carried by the Internet in the form of e-mail. The Internet was a radical break in three ways. First, it was designed to operate over any digital transmission medium. Second, routing was decentralized. Third, large messages were broken into fixed size packets, and then reassembled at the destination. All previous networks had used controlled media, centralized routers and dedicated connections. As the Internet grew, it used progressively faster digital carrier links, employing the digital systems that had been developed for the PSTN. As the PSTN became a digital network, T-carrier "synchronous" networks became commonplace in the U.S. A T-1 line has a "frame" of 193 bits that repeats 8000 times per second. The first bit, called the "sync" bit, alternates between 1 and 0 to identify the start of the frames. The rest of the frame provides 8 bits for each of 24 separate voice or data channels. Customarily, a T-1 link is sent over a balanced twisted pair, isolated with transformers to prevent current flow. Europeans adopted a similar system (E-1) of 32 channels (with one channel for frame synchronisation). Later, SONET and SDH (the synchronous digital hierarchy) were adapted to combine carrier channels into groups that could be sent over optic fiber. The capacity of an optic fiber is often extended with wavelength division multiplexing, rather than re-rigging new fiber. Rigging several fibres in the same structures as the first fibre is usually easy and inexpensive, and many fibre installations include unused spare "dark fibre," "dark wavelengths," and unused parts of the SONET frame, so-called "virtual channels." As of 2006, the fastest well-defined communication channel used for telegraphy is the SONET standard OC-768, which sends about 40 gigabits per second. The theoretical maximum capacity of an optic fiber is more than 10^12 bits (one terabit or one trillion bits) per second. As of 2006, no encoding system approaches this theoretical limit, even with wavelength division multiplexing. E-mail was first invented for Multics in the late 1960s. At first, e-mail was only possible between different accounts on the same computer. UUCP allowed different computers to be connected to allow e-mails to be relayed from computer to computer. With the growth of the Internet, E-mail began to be possible between any two computers with access to the Internet. Various private networks (UUNET, the Well, GEnie, DECNET) had e-mail from the 1970s, but subscriptions were quite expensive for an individual, $25 to $50 a month, just for E-mail. Internet use was then limited to government, academia and other government contractors until the net was opened to commercial use in the 1980s. In 1992, computer access via modem combined with cheap computers, and graphic point-and-click interfaces to give a radical alternative to conventional telex systems: personal e-mail. Individual e-mail accounts were not widely available until local ISPs were in place, although demand grew rapidly, as e-mail was seen as the Internet's killer app. The broad user base created by the demand for e-mail smoothed the way for the rapid acceptance of the World Wide Web in the mid-1990s. International Telex remains available via e-mail ports. It is one's e-mail address with numeric or alpha prefixes specifying one's International Record Carrier and account. Telex has always had a feature called "answerback" that asks a remote machine to send its address. If one is using telex via e-mail, this address is what a remote telex user will want in order to contact an e-mail user. Western Union announced the discontinuation of all its telegram services effective January 31, 2006. Only 20,000 telegrams were transmitted in 2005, compared with 20 million in 1929. According to Western Union, which still offers money transfer services, its last telegram was sent Friday, January 27, 2006.. Telegram service in the United States and Canada is still available, operated by International Telegram. Some companies, like Swedish Telia still deliver telegrams, but they serve as nostalgic novelty items rather than a primary means of communication. The international telegram service formerly provided by British Telecom has been spun off as an independent company which promotes their use as a retro greeting card or invitation. In the Netherlands, telegram operations ceased in 2004. In Belgium, however, services continue through Belgacom. In this case, business is flourishing; many telegrams are sent every day. In Japan, NTT provides a telegram (denpou) service that is today used mainly for special occasions such as weddings, funerals, graduations, and so forth. Local offices offer telegrams printed on special decorated paper and envelopes. ↑ Western Union, Western Union. Retrieved March 17, 2008. ↑ Western Union Sends Its Last Telegram, NPR. Retrieved March 17, 2008. Sparks Telegraph Key Review – Interactive and pictorial history of telegraph keys and telegraphy with an emphasis on wireless. This page was last modified on 18 November 2015, at 15:49.